You could give the college graduate, newlyweds or couple celebrating an important anniversary a bottle of Armand de Brignac Brut Gold, but how long would it last? 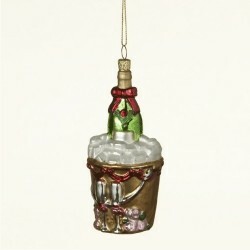 This champagne bucket glass personalized Christmas ornament will still be on the tree for the recipient's pleasure when the bubbly is just a memory. We jest, but this quality glass ornament truly is a fitting gift to celebrate the achievements, joys and milestones experienced by family and friends in the past year. The champagne bucket and bottle glass Christmas ornament is categorized with our anniversary ornaments personalized by our calligraphers, but like great champagne, it's perfect for all special occasions.